They are taxonomically difficult group and having ecological and economical importance. Adults are usually nocturnal hiding during day time under stones, in leaf litter, or under the bark and attracted to light. Several species are diurnal and can be found upon flowers. Body elongate, antennae long, usually11- segmented, labrum exposed, hind pronotal angles well developed, procoxal cavity open both internally and externally, posterior margin of prosternum elongated to form prosternal spine form the characteristic Jump-Click mechanism. Jumping mechanism without legs support is a unique character of adult elaterid. Most of larvae are predators; they are elongate, cylindrical to flattened body. 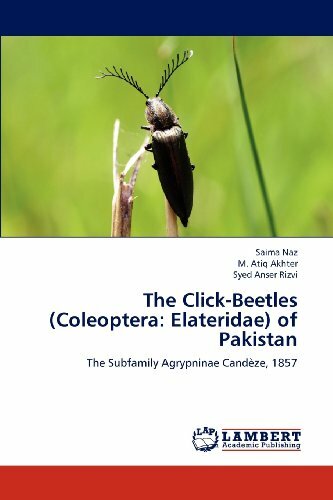 In the present work, a contribution towards the knowledge about Elateridae of Pakistan, mainly agrypnids (Agrypninae: Agrypnini, Conoderini, Hemirhipini) have been studied.